The Grand Treehouse Resort of Eureka Springs is the newest treehouse resort and most exclusive resort Eureka Springs has to offer. 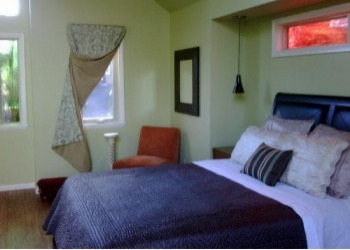 The Grand Treehouse Resort offers more amenities than any other Treehouse lodging. Built by the Green family, The Grand Treehouse Resort is nestled in the middle of a wild life forest about five minute's drive to historic Eureka Springs. You can leave your car and ride one of our wonderful trolleys to anywhere you would like to go in Eureka Springs. The trolley stop is just across the street. Just click onto the Treehouses link above to view all the styles and amenities we have to offer. We offer real Treehouses, some with trees actually growing through them. A special thanks to award winning Mary Tate for Interior Decorating and Consulting. Mary has been featured on the cover of the July 2009 Architectural Digest as well as in other magazines such as Veranda and Better Homes and Gardens. All you need to bring is yourselves! 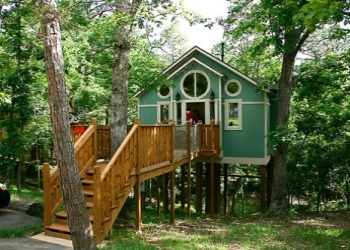 Sit back, relax, and enjoy the view at The Grand Treehouse Resort of Eureka Springs. Click on the Reservations link above to inquire about availability or call us at 479-253-TREE (8733).